I was lying in a dizzy half-awake state and listened to the unnerving tic-toc sound of an old grandfather clock. How would I ever be able to sleep with that noise? But hadn’t I been asleep just moments ago? Was it even morning or evening? Time felt foggy and undefined and my only half-functional mind struggled to make sense of it. I looked at the clock on my nightstand. Almost 3AM. Full consciousness arrived at last, and with that a startling realization: I had a digital clock. I didn’t own any device that would produce the kind of sound I was hearing. Yet the sound remained, if anything it was even clearer than before. A low, regular tic-tocing from somewhere in the building. Or maybe not so regular? The longer I listened the more I noticed slight variations in the volume, and a few times it even seemed to pause for a moment. Eventually I had to get up and check. The sound was a little louder in the next room, but there was no obvious source for it here either. After waiting and listening for a while I decided that it was coming from upstairs. And not only that. I could now hear some smaller, softer sounds accompanying it. A rustling of cloth and a slight creaking of the beams as something heavy shifted its weight. There was someone in my house. I grabbed a long aluminium ruler, the only weapon I could find at a moment’s notice, and sneakily went up the stairs. As soon as I entered the upstairs corridor I saw it. 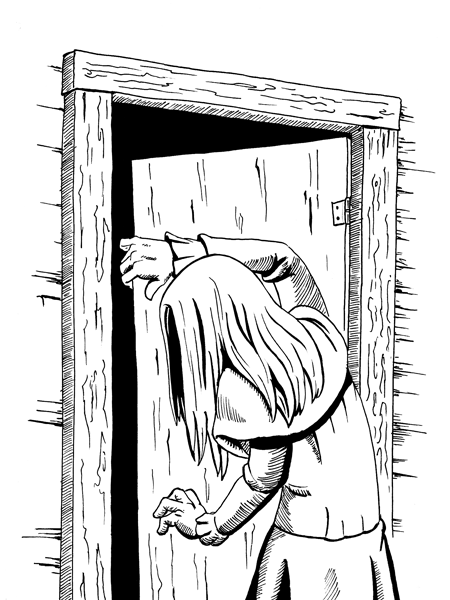 A hunched figure was shambling towards the door on the far end. At first glance it looked like a woman in an old-timey dress, but her skin looked weirdly dry and yellowish, like old paper, and when she stopped and turned to me in the dusty moonlight I saw that she didn’t have any facial features whatsoever. No eyes or nose or mouth, only two long horns protruded from her forehead and bent down over her empty face. But that wasn’t even the worst part. She didn’t have any feet. Her legs ended in two thin, pointy stilts, and those produced the infernal tic-tocing sound every time she took a step.